In her intellectual property practice, Kelly Hughes focuses on patent defense litigation. She offers clients a unique combination of technical, entrepreneurial and legal acumen. 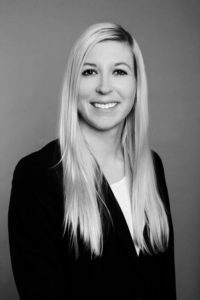 Kelly’s legal experience includes time at a robotic and digital technology toy company. She also worked for Justice Allison Eid of the Colorado Supreme Court and for the Honorable Judge Wasserman of the Colorado 17th Judicial District. Additionally, Kelly performed prior art searches and patentability analyses for the University of Colorado Anschutz Medical Campus Technology Transfer Office. Before becoming a licensed attorney, Kelly gained valuable work experience in the medical field. Kelly’s medical experience includes working as a research assistant for the University of Colorado Anschutz Medical School. She helped conduct research on the effects of ENT2 and Per2 on cardiac and pulmonary inflammation. Her work was published in several journals. Kelly is admitted to practice in the State of Colorado and before the United Stated Patent and Trademark Office.